To enhance the operational efficiency of its fleet, China Shipping Container Lines Co., Ltd. (CSCL) has rolled out ECO-Assistant onto its entire fleet of eight 14,000TEU container vessels, following a successful test of the software on one of these vessels. Furthermore, an extra agreement was signed to expand the deployment of ECO-Assistant to another eight 9,600TEU container vessels of CSCL's fleet. ECO-Assistant is advanced trim optimization software developed by FutureShip, the maritime consultancy unit of classification society Germanischer Lloyd (GL). Once installed onboard, it can produce instant fuel savings and a reduction of the ship's CO2 emissions. The sea trial report provided by FutureShip demonstrated that fuel savings of 10% have been achieved in one sailing of the 14,000TEU container vessel using the tool. A further verification test conducted by CSCL resulted in a reduction of fuel consumption of up to 8.2%. ECO-Assistant has displayed in the real operation its instant effect in saving fuel and cutting down on emissions. While used as a hands-on tool for lowering the operational cost of a fleet, it also has the potential to be instrumental in reducing the fuel consumption and environmental footprint of the whole shipping industry. 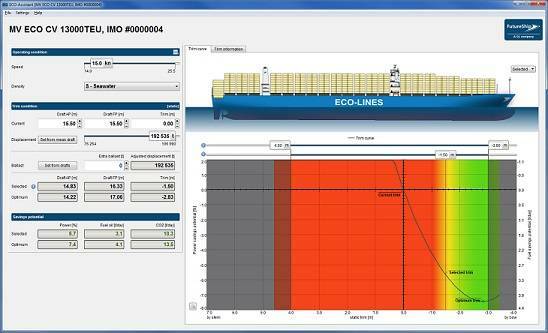 Trim is one of the central drivers of energy efficiency in ship operation. The ECO-Assistant delivers an optimum trim angle for a specific ship with an input of a few simple operational parameters, such as current speed, displacement and water depth. As a result, fuel savings and reduction of CO2 emissions can be realized instantly. The initial investment in implementing the system can usually be paid back in the short term. "As well as its instant effect, this software is easy to install, as there is no need to modify the vessels. The software itself is also very user friendly, so the training required is minimally time intensive,"
said Vincent Li, Vice President of FutureShip China. "The system can also be deployed in all types of vessels, including container vessels, multi-purpose vessels and bulk carriers." Since its launch in 2009, there have been more than 300 installations of the tool onboard and onshore across the globe. In Asia, it is being employed by many large operators including Masterbulk. In 2012, ECO-Assistant won the Environment Award at the Lloyd's List Asia Awards.